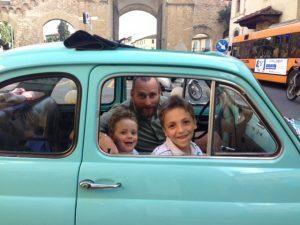 This tour will allow you to cruise around in the picturesque Tuscan landscape in a legendary car: the original vintage Fiat 500! We’ll exit out through the ancient walls of the city and drive towards the panoramic Piazzale Michelangelo to admire a picturesque view of Florence and the beautiful church of San Miniato. Then we’ll goes straight into the Tuscan hills with a cruise through the most hidden roads of the Tuscan countryside, heading to Impruneta, a lovely Italian town which still shows traces of its Etruscan past and to the area of Pozzolatico, where all the most ancient Chianti villas stand. On the way back we’ll head into the elegant neighborhoods of Florence for a tasty stop at a Renaissance Villa where you will have the opportunity to enjoy a delicious Tuscan meal accompanied by local wines. All food served at the villa is made with fresh ingredients and gives you a taste of the true Italian cuisine. After lunch we will be ready to enjoy a final ride on our Fiat 500 back into the center of Florence. The tour includes a Tuscan lunch with wine tasting, a fully equipped Fiat 500 and an expert guide to show you the way. * Service performed by We Like Tuscany, inc, which reserves the right to substitute any part or all of the tour with an activity of equal of greater value. Time 11.30 a.m. to approx. 3.30/4 p.m.
Gilberto: gilberto@de-gustibus.it(tour leader) +39 393 2355445.